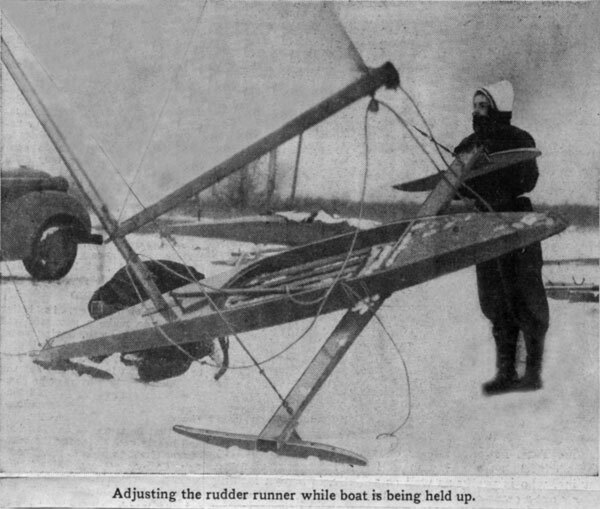 I was lucky enough to befriend one of the original builders of the DN iceboat, Don Daller. Don was a great guy, always cheerful, and came to every swap meet with a box full of early pictures and articles about iceboating. When he finally got to where he could no longer carry his iceboat to the ice, he sold me his boat and transferred the sail number to me. I'm proud to sail with number 46, and will always remember Don. Later, as Don's health started failing, he asked me to take posession of his collection of iceboat articles. For several years I brought the binders to swap meets, but the pages were getting old and some of the articles ended up missing. I always wanted to preserve some of those articles, and this is a start. 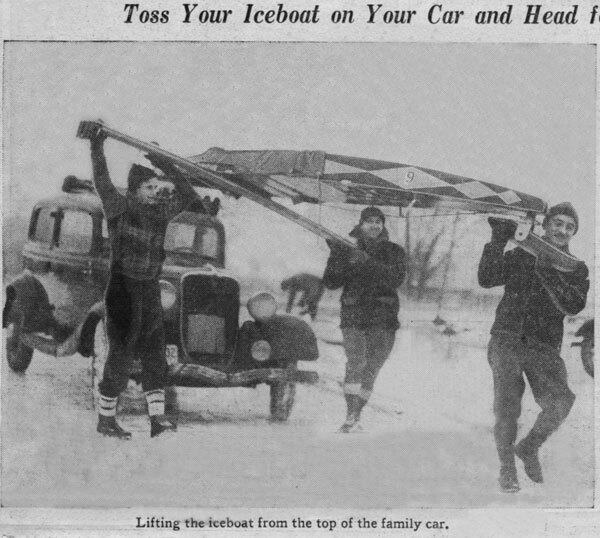 What we call the DN Iceboat started out with humble beginnings at the Detroit News hobby shop in the mid 1930's. The original design was a collaboration between master woodworker Archie Arrol and iceboaters Joseph Lodge and Norman Jarrait. Times were tough, with the US in a deep depression, and most iceboats were expensive toys of the rich and famous. Joe Lodge and Norm Jarrait saw a need for an inexpensive, home-buildable iceboat that could be built out of common lumber and simple hardware. 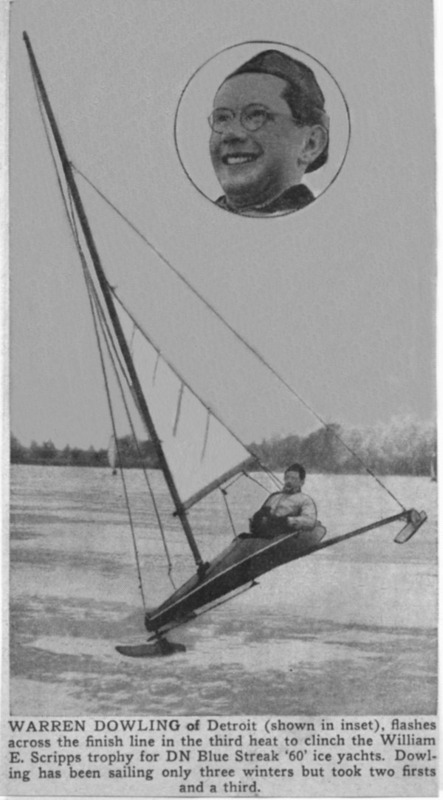 They designed the new iceboat so one person could load it on the roof of a car, or fit it in the bed of a pickup truck. It was Joe Lodge's idea to make the new iceboat a front-steerer. They called their boat the Blue Streak 60. 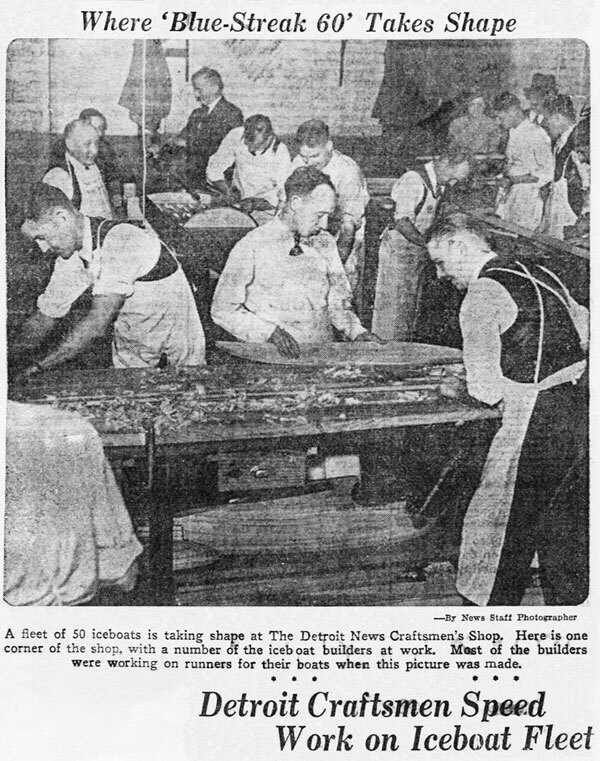 Archie, who was the head of the Detroit News hobby shop and had been building model yachts for years, worked with Joe and Norm in 1936 to build the first Blue Streak 60. The first Blue Streak performed very well, especially in light wind. On the first day out on Lake St. Clair in the winter of '36, while the big boats like Deuce, Bernida, and Flying Dutchman couldn't move, the Blue Streak surprised the other iceboaters the way she could sail with hardly any wind. 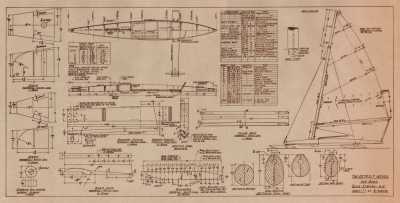 In 1937 a group of about 50 wanna-be iceboaters got together at the Detroit News hobby shop, and for the sum of $32 were supplied with all the materials needed to build a Blue Streak 60, including a sail built by Howard Boston. In those days, $32 was a lot of money, at the time Don Daller was working for $0.50 an hour, three days a week. They scrounged parts where they could - the steering was accomplished with '34 Ford brake rods, rigging was galvanized steel from the local hardware store. The mast didn't have a halyard, you simply cleated the sail at the top and bottom of the mast and stood the whole rig up on the boat. The mast had a cut-off lag bolt in the bottom which fit into a hole in the deck - no ball and socket needed. Runners were angle iron on white oak bodies. Unfortunately most of the boats built in 1937 broke up in the first season due to some design deficiencies. Joe and Norm redesigned the Blue Streak 60, and the same group of builders got together to build a second set of iceboats in 1938. Some of the '38 boats are still around, and at least one still gets out on the lake occasionally. As seen in the picture below, sailors in the early days didn't even take off the plank for transport! Also note the front runner, the second set of runners the group built (the first set were angles) were T-irons. 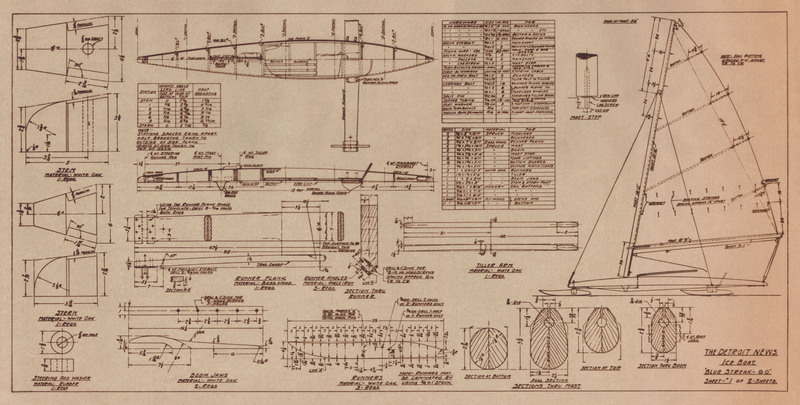 There was originally only one sheet block on the rear deck of the Blue Streak - a 2:1 mainsheet purchase. Later another block was added to the boom to make a 3:1 puchase, and then eventually a second block on the deck for 4:1 - the same as on todays DN. The mainsheet went through a single turning block on the mast, not on the boom or tiller post, and no ratchet block! The mainsheet didn't provide any downhaul on the luff of the sail, instead the luff rope went through a hole in the boom jaw and was tied to a cleat. Over the years the design was modified at the whim of the builders, and the name was changed to the DN 60. A group of DN sailors got together in 1953 at Clifford Cartwright's house on Cass Lake and outined a Constitution. 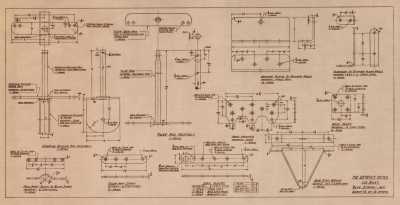 The first Specifications were drawn up on the wall of Cartwright's basement shop, where many of the original specs are still evident today. 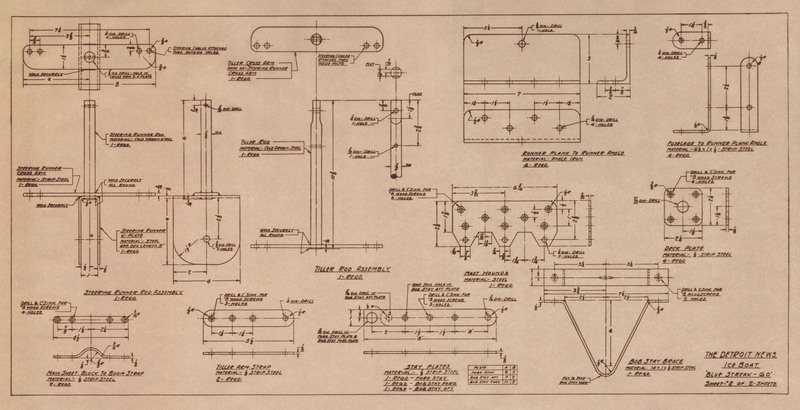 Bill Sarns drew up the first set of "modern" plans and the DN class adopted them as the Official Plans. Other design changes slowly made their way into the DN. Some changes stood the test of time, while others faded into history, like Chuck Cartwright's mini runner on the tail block - a solution to a problem caused by the ultra-flexible planks favored at the time. The next big change was inspired by Jan Gougeon - which moved the widest point of the hull from the middle (just behind the mast step) to the plank. The Gougeon "wedge" design has been the basis for all other DN designs since it's introduction. Actually Jan's design was preceded by Chuck Cartwright's "Banjo Boat", which was narrow all the way to the front of the cockpit, then flaired out around the skipper. Chuck won the Annual Regatta with the Banjo Boat, but was thrown out because the design was too radical. The modern DN bears only a resemblance to the Blue Streak 60. Under no circumstances should a DN be built in the 21st century using these plans!